A lot of users have been reporting a weird “lockdown.cpp:57” error in Cydia Impactor. Here are a few methods you can try to fix this error. What does lockdown.cpp:57 error mean? 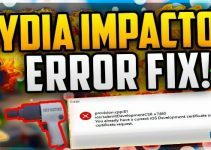 Each error in Cydia Impactor utility has a specific meaning. There are lots of error this tool throws and each one of them signifies that something is wrong with your setup (computer, device, iOS version, etc). The lockdown.cpp:57 error signifies an issue with your device. The only person who knows the meaning of each error is Saurik, the godfather of jailbreaking. He has been very busy of late and is nowhere to be found in the jailbreak community. Thankfully, I have a few fixes for this error that are worth giving a shot. This is the main reason why Cydia Impactor throws this error in the first place. When you connect your iOS device to your computer, you must “trust” it. When you get this alert, simply tap the “Trust” button. If the above fix doesn’t work for you, this will most likely fix it. Open iTunes on your computer, go to the Account option and Sign In with your Apple ID and password. While not using the original cable is not much of an issue, it can make Cydia Impactor throw errors. Always use original cable and other accessories to minimize problems. At the moment, this tool is incompatible with the 64-bit versions of Ubuntu. Therefore, you must use a different operating system to get it to work. If you are running iOS 11 firmware, I recommend you downgrade to a different firmware. I will soon do a guide on fixing lockdown.cpp:57 error for iOS 11 users. If you run into some issues, let me know the comments section below. For more tutorials and guides, subscribe to our social channels. Opening iTunes and logging in fixed it for me. (METHOD 1 – TRUST YOUR COMPUTER) Worked for me. Welcome, Omar. Glad it worked for you. only one thing worked for me. it was the cable. I have several aftermarket cables all brand new. None worked. Used my old OEM apple cable, first try it worked just fine. Hey guys, I had the LOCKDOWN_E_PASSWORD_something-something. Then I opened itunes and reconnected my phone- Make Sure You Properly “Allow” Computer On Your Phone (iTunes was logged into a different account than my iPhone but didn’t seem to matter). OK, then I got LOCKDOWN_E_PLIST_ERROR. This one was just as simple: make sure that Impactor is actually installed on your HDD (AKA, drag and drop into your Apps folder). Then make sure it’s up to date. Worked for me after that. P.S. I figured this out by trying to update a non-HDD version of Impactor. Opening iTunes on my computer and trying again worked for using on my Apple TV. Thanks! Trust your iPhone and install the latest version of iTunes. This should fix the error. It was the certs, for sure. Also try to simply exit the impactor and restart it while being plugged into the phone…. Thanks for the tip, Mija. That also worked for me, thanks. Glad it worked for you, mate.